Jubilee cheese is a fresh soft cheese with a spicy flavor characterized by brown specks of nutmeg on its surface and body. It is made from goat’s milk by salting, pasteurizing, and coagulating with IFS-6 milk coagulant before cutting, draining, and addition of nutmeg powder, knitting, blocking and packaging. 1. Strain the milk through a nylon cloth, pour into a sauce pan. Add salt and stir well until completely dissolved. Then, heat it over a low flame to 75oC, stirring slowly. At this temperature, steam or vapor may be seen rising from the milk surface when the milk is about to simmer. 2. Immediately cool milk to 38oC by placing saucepan in a basin of cold or tap water. Add the milk coagulant, and stir the milk for one minute. Cover and leave the milk undisturbed for 30 to 40 minutes. With a kitchen knife, cut the coagulated milk or coagulum into one-inch cubes. Without disturbing the curd, remove the free whey by means of a scoop or dipper. 4. Cut the knitted curd into pieces of desired size, and serve. The cheese may be wrapped in plastic streets or banana leaves and stored in the refrigerator overnight before serving. Jubilee cheese may be served on top of a lettuce leaf garnished with slices of tomato or peach. 5. 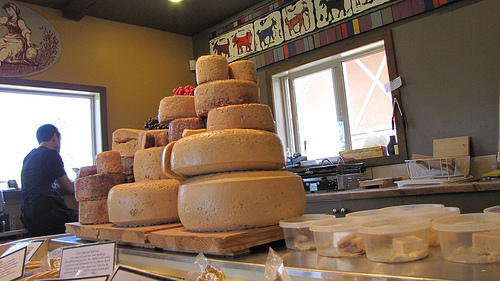 One to 1.3 kilograms of Jubilee cheese can be produced from five liters of goat’s milk.